It's an exciting time when a teen first gets behind the wheel with their driver's license. You no longer have to ask around for rides, and in general, you just gain so much more freedom. Once you've got that driver's license, a whole new world of possibilities opens up. For those 18+ who need to learn how to apply for a new CA driver's license in California 18+click link. At first glance, getting your license may be a little daunting, but the following information will take you step by step through the process of getting your license in an easy-to-follow format. California, among many states, has a Graduated Driver License (GDL) program that teens are required to go through in order to get their driver's license. Many of the stages of the GDL depend on a person's age and driving experience, and these stages are meant to help young drivers drive more safely. If you are 15 and a half years old, you are eligible to get a learner's permit if you are taking a driver's education course. At 16 years old, you are able to get a provisional driver's license after you complete your driver's education course. At 17 and a half years old, you are able to get a provisional license without having to take driver's ed. Those who are 18 and older may apply for their driver's license without any kind of learner's permit. People of any age may apply for CA ID cards. If you're between the ages of 15.5 and 17.5, you must apply for a provisional license. If you're under 17.5, you must complete a driver's ed course, but older teens may get their learner's permit without taking a driver's education course. You must complete a state-recognized driver's education course that includes at least 30 hours of classroom time. You must prove that you are at minimum 15.5 years old and younger than 18. You must verify legal presence with a birth certificate or passport, and if your name does not match what is on those documents, you must give your true name. You must turn in Form DL 44 with a guardian's signature, which you can get at your CA DMV office. You must pay a $33 application fee. You must pass a vision exam. If you're in the range of 15.5 and 17.5 years old, you'll be applying for a provisional permit. The steps for obtaining this permit are outlined below. Your first step towards getting your full driver's license is getting a provisional permit. If you are under the age of 17.5, you have to finish a driver's education course before you get a provisional permit. This course should have at minimum 30 hours of classroom time and should be taught in a public high school, private high school, or a state-recognized driver's ed school. The state of California gives you the option of completing driver's education in a classroom or online. Taking it online comes with the advantage of being able to take it at your own pace, so it's nice to have the choice. If you're looking to pass your DMV written test on your first try, you might consider using external resources to help you study. One such way is by using an online practice test in which you will be asked similar questions to the ones you'll find on your real test. For the best chance of passing, you should check out our free California Permit Practice Test. These can be considered cheat sheets that will greatly help you prepare for the test as they include information straight out of the CA DMV handbook. You may have learned while studying for your permit test what the penalties are for driving without car insurance. Remember, you are required to have liability coverage for the vehicle that you will be driving, but there are several other types of coverage available to you, at varying costs. Make sure you are getting the lowest insurance rate for your age. 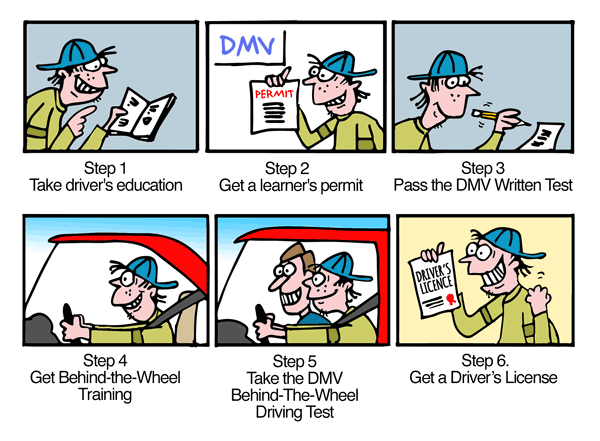 After finishing your California driver's education course, and you've nailed the online practice tests, you'll be ready for the real deal at the DMV. A filled-out Form DL 44, which can only be obtained from your local California DMV in person. Proof of your full name, SSN, and age. Your certificates indicating you have completed both driver's education and driver training. As a reminder, have a parent sign off on your documents. The written test will have all kinds of questions about the traffic laws of California, safe-driving rules, and identifying road signs and traffic signals. Everything on the exam comes right out of the California DMV handbook. The test has a total of 46 questions, and you must answer at least 38 of them correctly. You'll be given three attempts to pass. If you do not pass, you must wait seven days before you are eligible to try again. After passing the written exam, and you've paid your $33 fee, you will have obtained your provisional license. The $33 fee pays for three total exams within the timeframe of a year and also covers your California learner's permit and California driver's license. If you do not complete everything that is required within the 12 month period, your application will be voided and you must repeat the steps. After receiving your provisional permit, you're going to be a little busy. Having this license means you understand the traffic laws and road signals for the most part, but you still need actual driving training. You might be wondering exactly how much practice you need. Well, when you have your CA learner's permit, you are required to finish 50 hours of driving time under the supervision of someone who is 25 or older with a valid license. 10 of those 50 hours must also be after dark. One last requirement is that you will need to perform 6 hours of training with a certified instructor. Proof of your full name, SSN, and your age. A filled-out Form DL 44, which can only be obtained by visiting a DMV office in person. Your parent or guardian so they may sign the documents. You must also still finish the 50 hours of driving time while having 10 of those after dark. After that, you are in the clear and eligible to take your road test to get your intermediate license. Once you've had your learner's permit for at least six months, are a minimum of 16 years old, and have finished your required 50 hours of behind-the-wheel practice, you are ready to apply for your provisional driver's license, which is also called your intermediate license. It may be a while before you need to learn about California license renewals, but don't foreget how important it is to renewal your license! Proof of insurance and vehicle registration on the vehicle you're driving in for your test. Not being able to drive between the hours of 11 p.m. and 5 a.m.
Not being allowed to drive with passengers under the age of 20 in your vehicle unless there is supervision from someone 25 or older with you. An emergency medical situation or family situation that needs immediate attention. After you've turned 18 years old, your CA provisional license restrictions will no longer be there, and you'll have the freedom of being able to drive as you please! Test Your CA Traffic Ticket Knowledge!